So, some of the ladies I work with have decided they are going to lose weight. Their motivation is to put $25 in a pot and at the end of 60 days, one lucky person will win the total of that pot. At last count I believe we were at $250. Not too shabby and I wouldn’t mind being the benificiary of that loot! Not to mention, I’m extremely competitive and what great motiviation to get in shape for summer. So I am devoting my diet to Weight Watchers. I have done Weight Watchers for years and I know when I follow it……it does work! So out come all of my old recipes. My pin boards are loaded with WW recipes and tips also. My monthly WW card came and along with my card was a recipe for Crunchy Top Mac N Cheese. I was craving pasta and comfort food and this one certainly did not dissapoint in any way. It is a large portion and very filling. 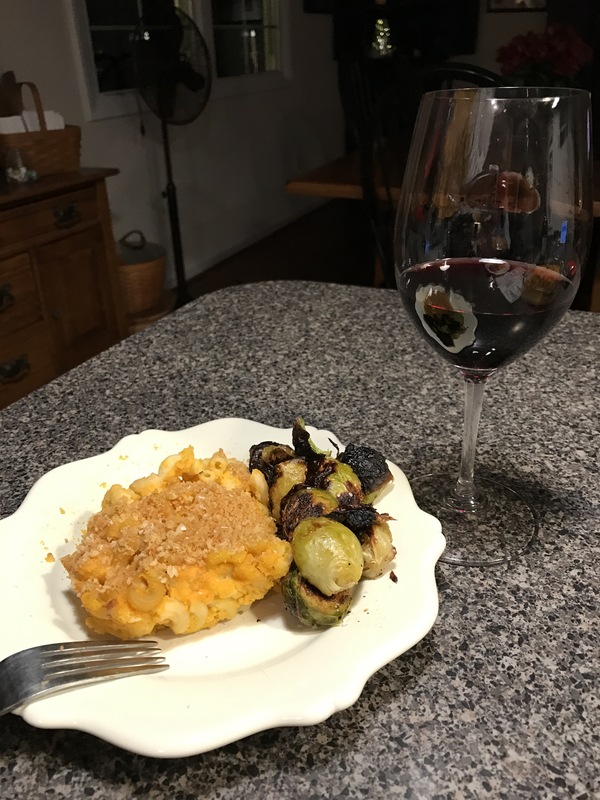 I rounded out the meal with roasted brussel sprouts, one of my fav’s, and both my husband and I found the meal very satisfying. I hope you will try it and tell me what you think. This has limitless possibilities for cheese choices, so make it yours. Preheat oven to 400 F. Spray 8 inch square baking dish with nonstick spray. Bring large saucepan of salted water to boil. Add squash to boiling water; cover and return to boil. Cook, uncovered, until squash is very tender, about 15-20 minutes. Bring water back to boil. Cook pasta half the time directed on package; add cauliflower during last 4 minutes of cooking time. Drain; return to pot. Stir in puree and toss to coat. Spread pasta mixture in prepared baking dish; top with crumb mixture and spray with nonstick spray. Bake until top is golden and casserole is bubbly, about 30 minutes. There are 4 servings at 7 Smart Points per serving. Previous Post BUTTERMILK BISCUITS..and failed fried chicken!